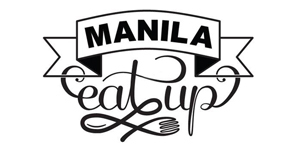 Home / Addicted to Truffle / addictedtotruffle / chef bobby g / dessert / featured / food / seafood / SM Aura / steak / taguig / The Foodie / the fort / todd english food hall / whats new / Attention, Truffle Lovers: Todd English Food Hall Manila Launches Special Truffle Menu! 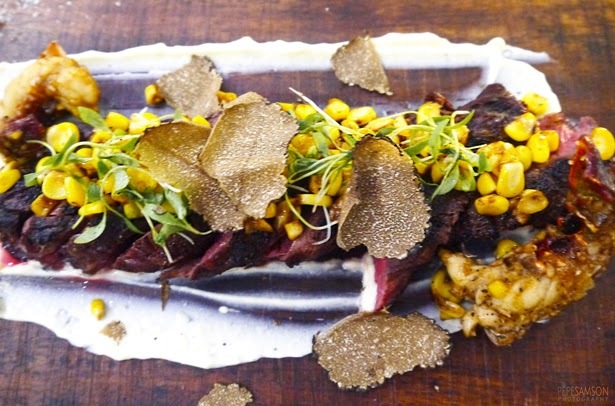 Attention, Truffle Lovers: Todd English Food Hall Manila Launches Special Truffle Menu! 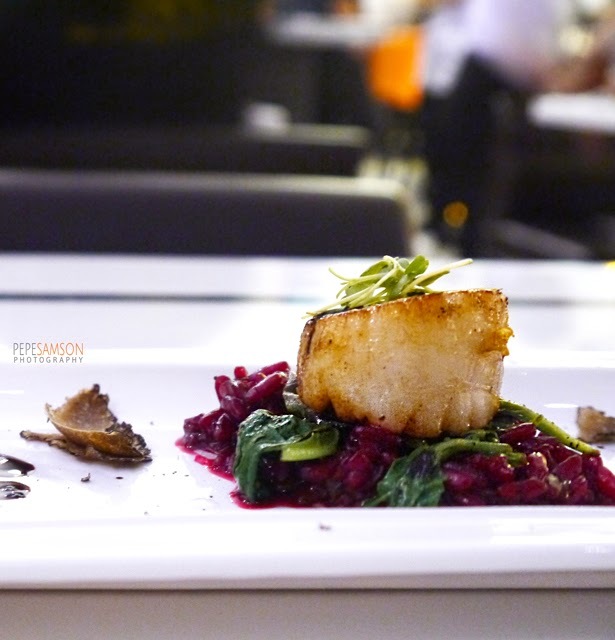 Truffle addicts like me have something new to celebrate as Todd English Food Hall in SM Aura recently launched its special, seasonal Truffle Menu. Fresh from his travels from Italy to New York, and then back to Manila, Chef Bobby Griffing brought along some 2 pounds of precious black truffles -- ready to be incorporated into Todd English’s (already amazing) dishes! 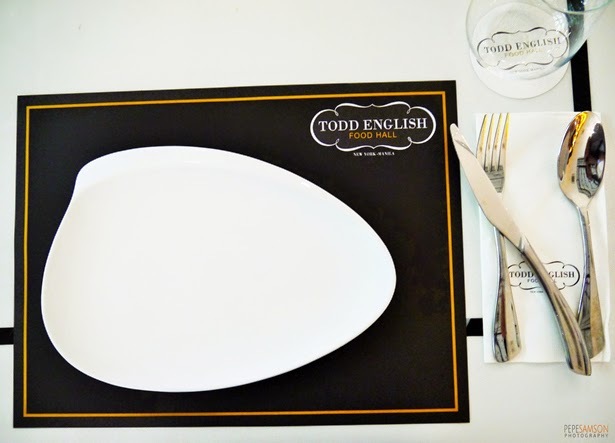 If you absolutely love any dish with truffles—freshly shaved, oil form, it doesn’t matter—the way I do, now is the perfect time to head over to Todd English and check out this limited offering! The special Truffle Menu will only be available for a certain period of time: specifically, until the truffle supply lasts! Damn, wouldn’t you just KILL for some of these nastily delicious stuff? My incredibly pleasant previous visit to Todd English made me even more excited to try this. Their food was exquisite (damn that Two-Way Duck), with incredible plating and perfectly balanced flavors. The ambience was posh without being intimidating. 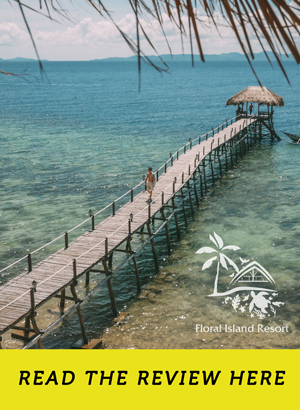 Simply put, I was really looking forward to coming again! 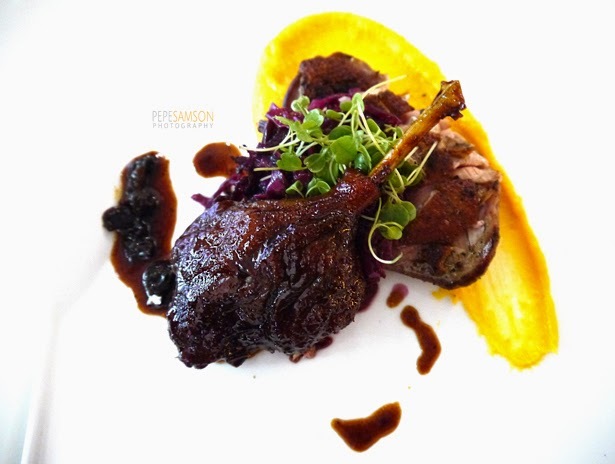 My Two-Way Duck (duck leg confit + sous vide breast) in a past visit to Todd English (PhP650). 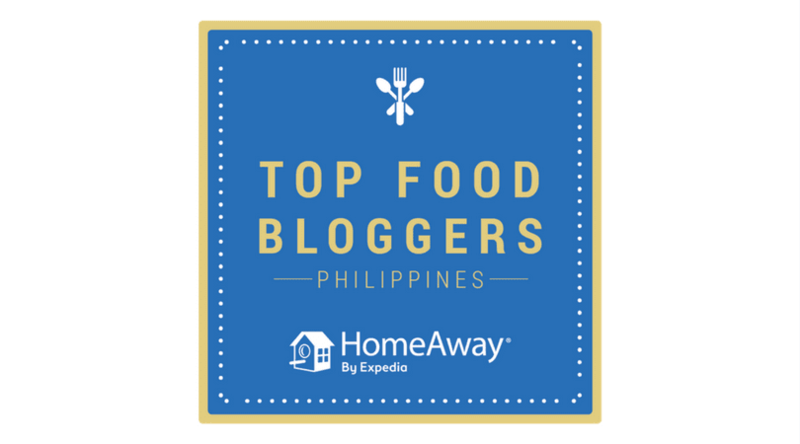 As of writing this, the Truffle Menu has already been out for a week, which means there is one gram less truffles for you with each passing hour, so I would suggesting assailing the food hall ASAP! 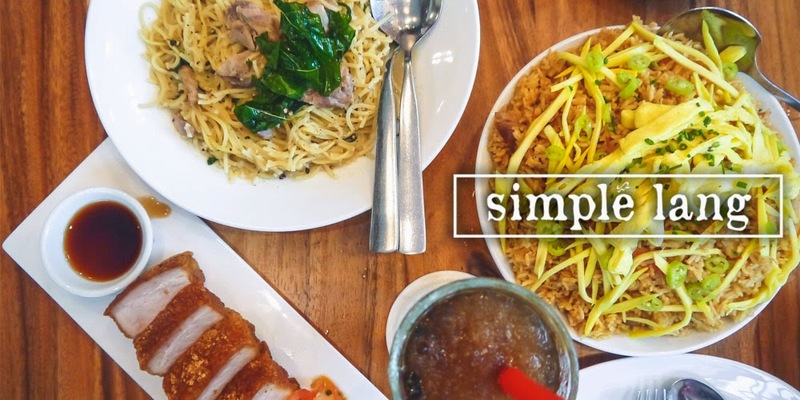 This limited offer is a set meal in 3-course, 4-course, or 5-course selections. 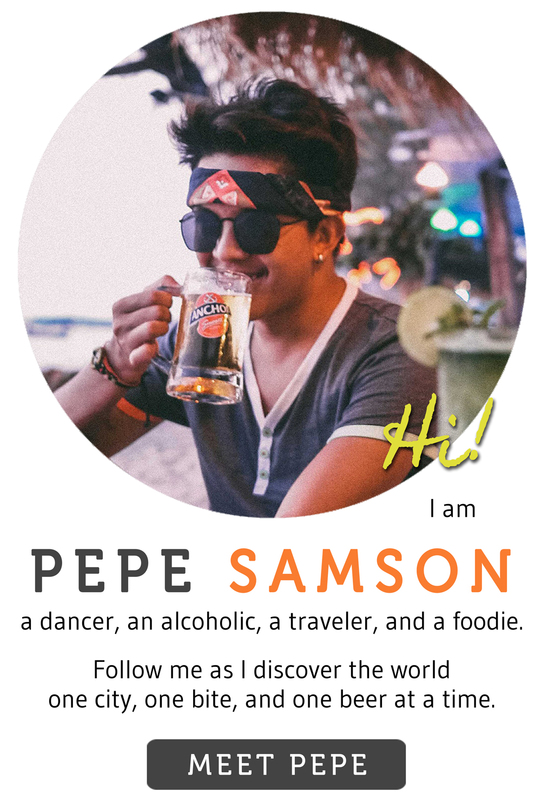 I was able to try the 3-course meal (PhP1,500++) composed of an appetizer, an entrée, and a dessert. 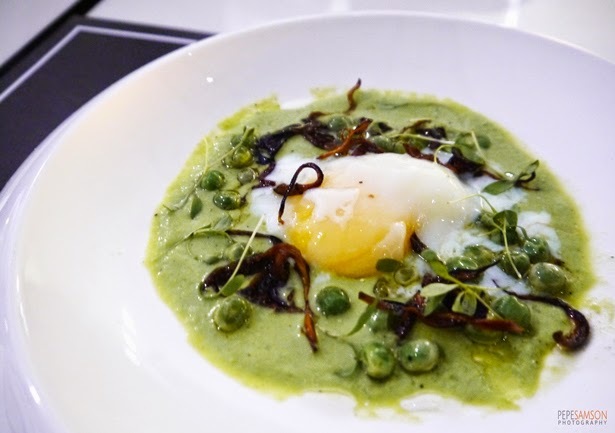 We started with The Perfect Egg—poached egg in a creamy pea puree, speckled with truffle salt and crispy oyster mushrooms. 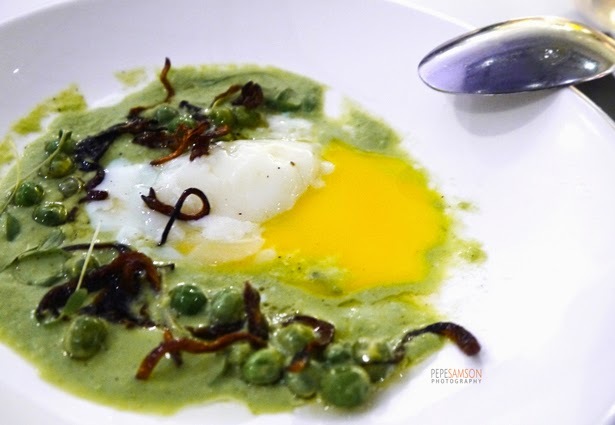 The truffle flavor was subtle, the oozing yolk divine, and the mushroom strips lent this appetizer an exciting crunch and saltiness. 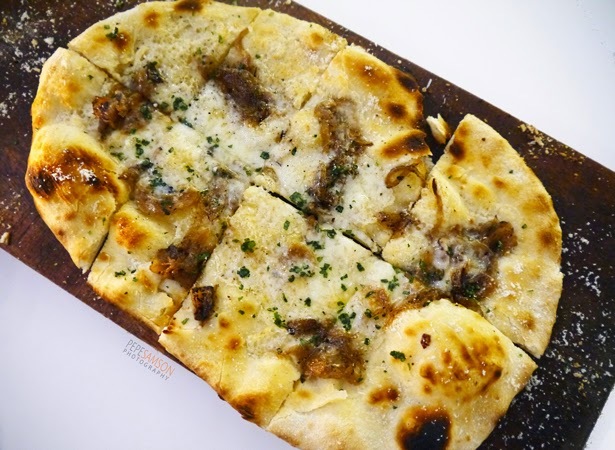 As we waited for our mains, Chef Bobby sent a Flatbread Pizza to our table—caramelized onions on a bed of Fontina cheese and crisp-and-chewy bread, then drizzled with truffle oil and parsley. OMG. It made me more excited for what further awaits! Truffle Funghi Flatbread Pizza (PhP700). THANKS, Chef Bobby! For entrees, you can select between the Surf and Turf (Steak and Lobster) and the Seared Scallops. It was incredibly hard to choose just one, since both looked and sounded delicious, but in the end I opted for the Surf and Turf. 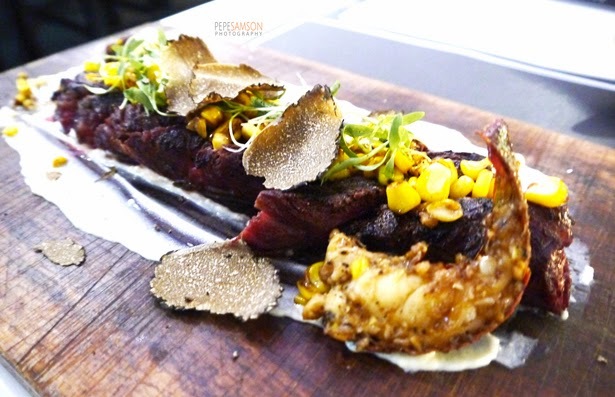 This dish is composed of a US Hanger Steak, truffle potato, bacon and corn succotash, fresh truffle shavings, and baby lobsters. 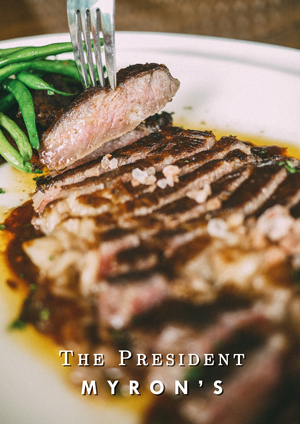 The 12-hour sous vide steak was incredibly tender and succulent, a perfect medium rare. The truffle potato was creamy and subtle, which for me was just right since there was a generous amount of truffle shavings atop my steak! LOOK AT THOSE BLACK TRUFFLE SHAVINGS!!!! I’m not crazy for seafood but I loved the lobster! Everything worked well, including the roasted corn strewn all over. I think the best part of this dish, however, was putting truffle salt into everything. It was just so freaking delicious! 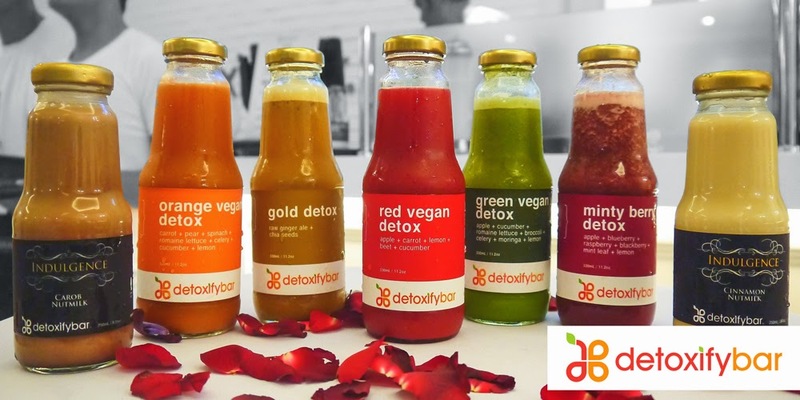 Let me know if you sell these by the bottle, Todd English! 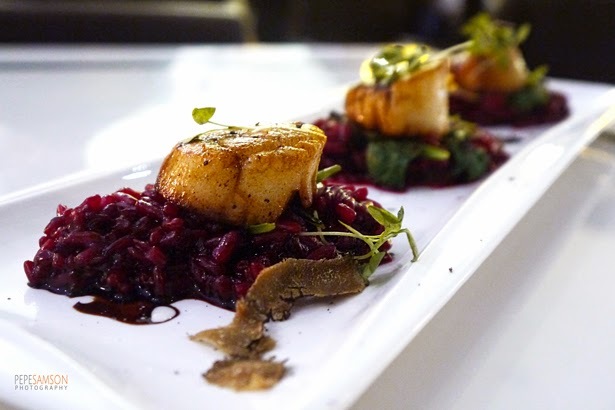 But while I prefer steaks over seafood, the Seared Scallops just really won me over. 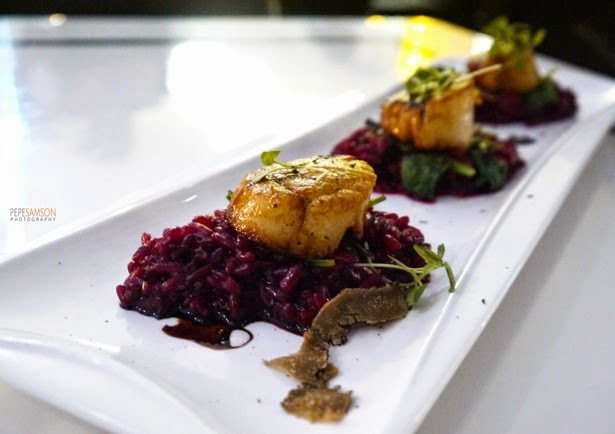 The butter-seared scallops were expertly done—very tender, moist, not rubbery—and the beet orzo was simply delightful, lending this dish a slightly sweet taste. Fortunately, my friend Nats ordered this one or I wouldn't have discovered how AWESOME it was! 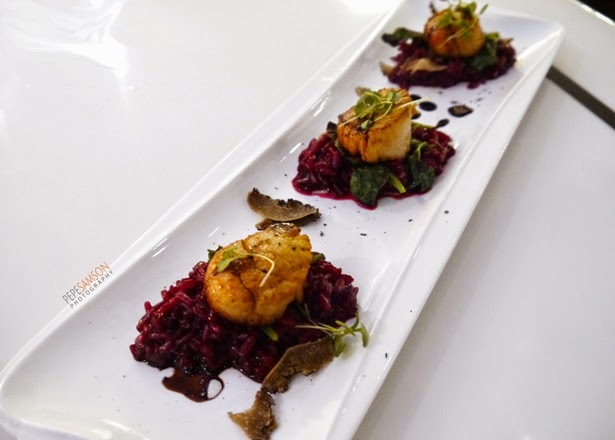 Each forkful was heavenly, with all the flavors blending together—including that of spinach drenched in truffle balsamic, and again, truffle shavings. Between the two entrees, I found the Surf and Turf to be very interesting, but the Seared Scallops was, for me, the winner. Chef Bobby kept things even more exciting with the dessert course: Todd English’s signature Nitro Ice Cream. 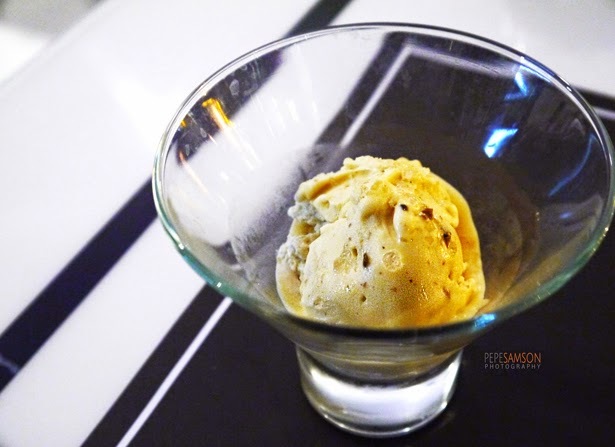 A crunchy caramel ice cream made in-house, and prepared in front of you. Liquid nitrogen helps the ice cream freeze faster, and minimize ice crystals, resulting in a perfectly creamy ice cream—almost like a gelato. The caramel ice cream was incredible, with sprinkles of truffle sea salt giving an altogether new dimension to this dessert with its texture and taste. One of the most memorable desserts I’ve ever had! 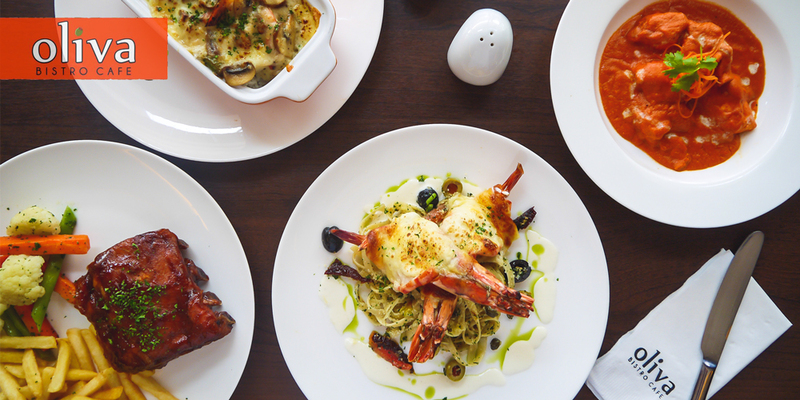 The creativity of Chef Bobby shines even more through his work in assembling this menu. Truffles are utilized in different forms and integrated with a variety of ingredients that enhance and complement their own flavors. 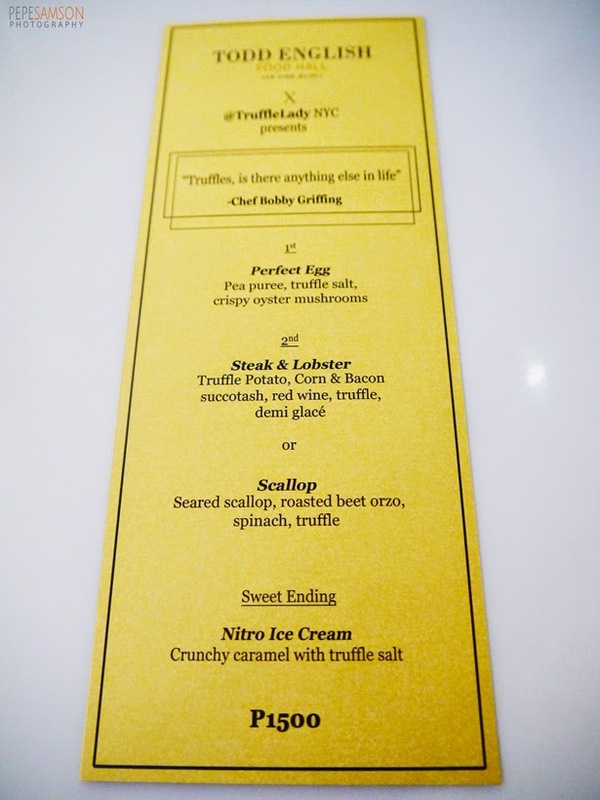 I found the 3-course meal enough to fill me up and satisfy my taste buds (and truffle obsession), but I’m curious to see what the 4- and 5-course has in store for us since they would mean extra items from Chef Bobby’s ingenious mind—and hands. 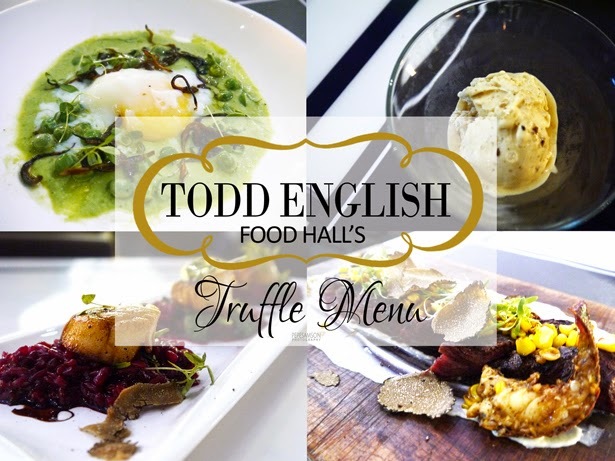 If you love truffles, enjoyed Todd English’s food in a past visit, or simply want to try this restaurant for the first time, I recommend trying the Truffle Menu in order to experience the best of what Todd English has to offer. 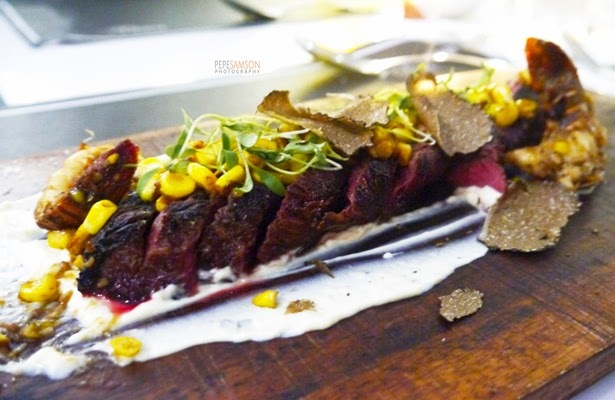 Indeed, Todd English keeps things interesting for picky diners with this special offering. 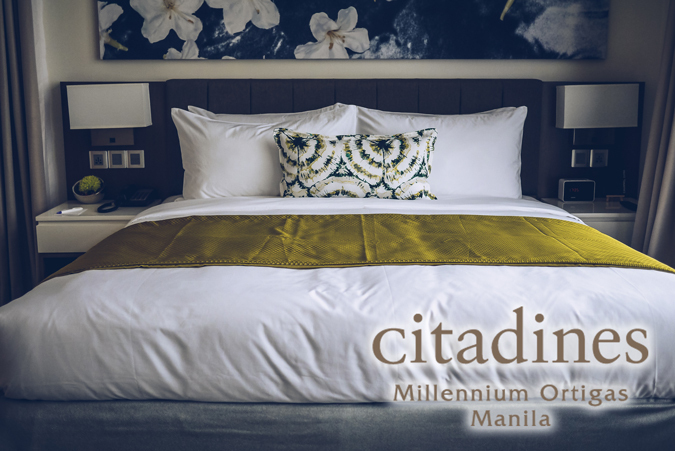 Hurry up because they only have this for a limited time! 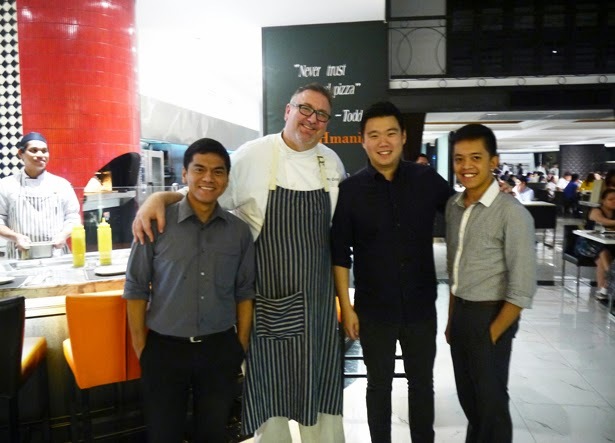 Thanks to Mr. Eric Dee, Chef Bobby Griffing, and Todd English Food Hall Manila for ultimately satiating my truffle cravings and for giving me this awesome dining experience! 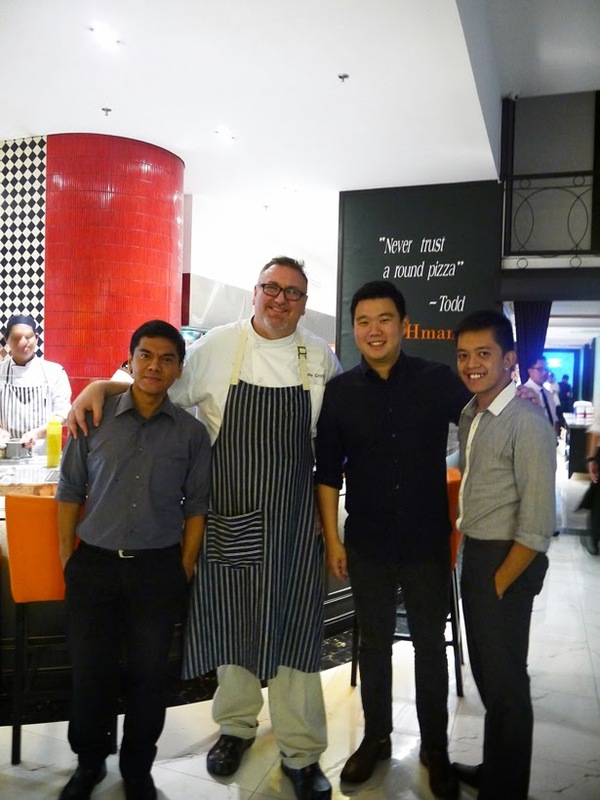 Another one to emphasize how tall Chef Bobby is. Haha! 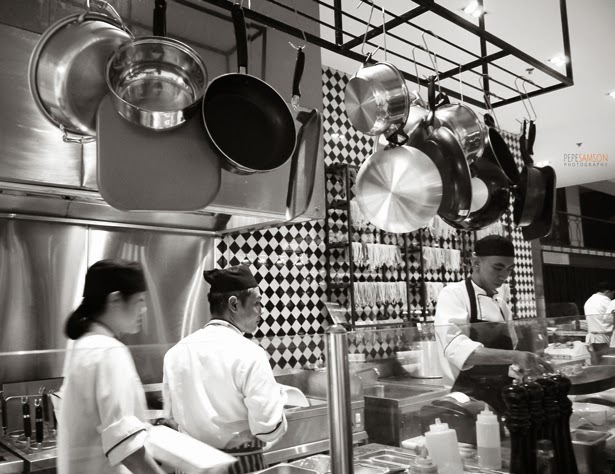 Have you dined at Todd English Food Hall? What's your favorite dish? 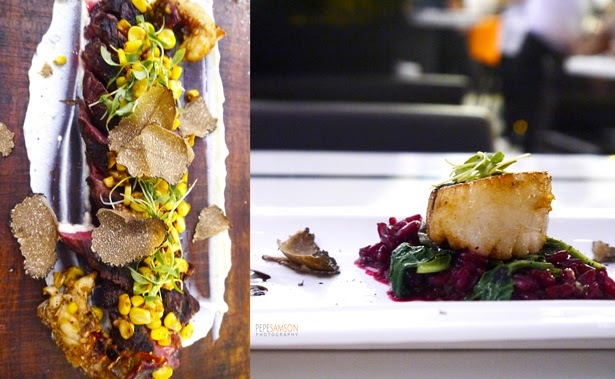 Are you curious to try the Truffle Menu or have you tried it already? Sounds in the Disqus comments section below! 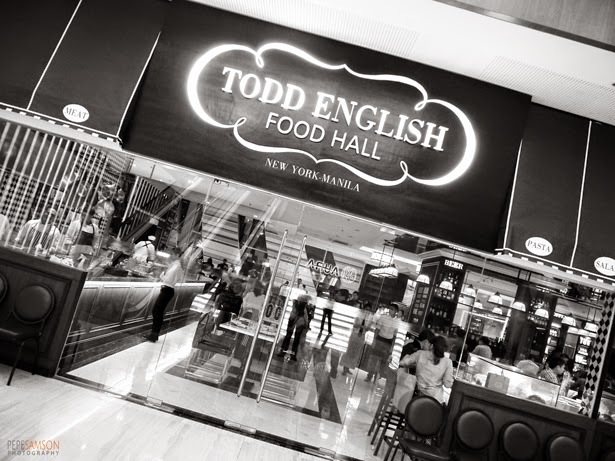 My meal was sponsored by Todd English Food Hall Manila. All opinions, however, are my own.